Bone broth is a gut healing, protein sparing liquid that is super healthy to drink. But, what if you are a vegetarian or vegan and do not want to use animal bones? 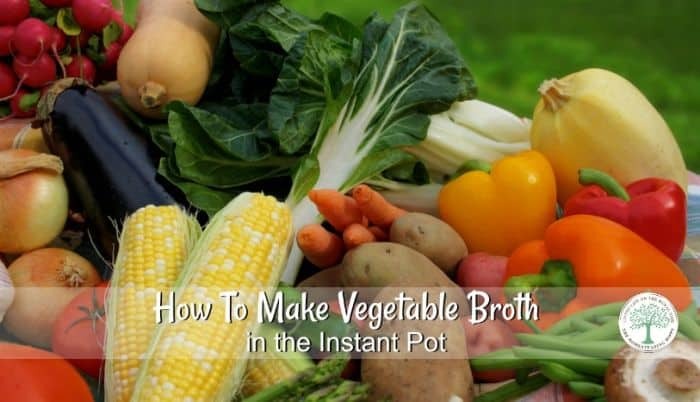 You can make delicious vegetable broth! The Instant Pot is amazing for this as well, as it ready to go in just 2 hours, start to finish. The best part? The ingredients for vegetable broth can be changed up to whatever you have on hand, and it will still be delicious. Vegetable broth is amazing when you add it to rice, to smoothies, or even just to drink hot. The warm comfort will soothe a sore throat, settle an upset stomach and more. If you still need to grab an Instant pot, they are available here. Add desired vegetables to the Instant Pot. Cover with fresh, cold water to the “max” line. When pressure is released, remove the lid and strain out vegetables. You can get directions on how to can your broth here. OR, you can even dehydrate it for ease of travel, camping or backpacking. Please note, you CAN make this vegetable broth in the crockpot as well. Simply follow the directions and add vegetables, seasonings, and water to the crockpot. Turn on low for 5-6 hours, then strain. You will still have the delicious broth that can easily be canned, dehydrated or enjoyed within 3 days. Can I do this in a crockpot and for how long? yes. I would leave it 12-24 hours.